Setley Plain lies close to the southern border of the New Forest, 2 kilometres (1¼ miles) south of Brockenhurst. Setley Plain offers impressive views over the improbably named Three Beech Bottom, Milking Pound Bottom and Widden Bottom, through which run railways to Lymington and Christchurch. And on clear days, Setley Plain provides on the distant horizon views of the rolling hills of the Isle of Wight; whilst Sway Tower, needle thin, rears up against the south-western skyline. Also known as Peterson’s Folly, Sway Tower was built in the late-19th century and stands at 218 feet high. It was constructed by Judge Andrew Thomas Turton Peterson, who set out to demonstrate the use and value of un-reinforced concrete. 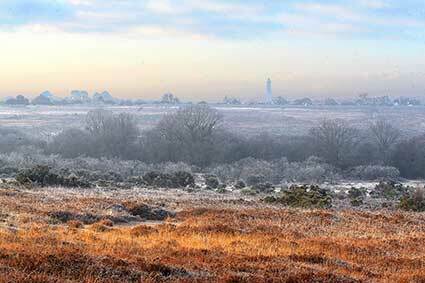 Setley Plain, like many New Forest heathlands, is a great place for wildlife. Birds include tiny Dartford warblers, stonechats, linnets and nightjars. Silver-studded blue butterflies and graylings are found, sometimes in impressive numbers; and a range of dragonflies and damselflies brighten-up spring and summer days. Wild flowers include some relatively scarce heathland and wet heathland species. Setley Plain is also rich in history. Here, for example, can be found three well-preserved Bronze Age tumuli of a type known as disc barrows - according to writer and archaeologist Heywood Sumner, they are the only disc barrows in the New Forest. All have relatively small mounds, a quite wide expanse of level ground between mound and surrounding ditch, and really impressive earthen banks outside the ditches. There’s also evidence on Setley Plain of a series of large, rectilinear enclosures which it’s thought were made following annexation of Forest waste by an adjacent manor during the medieval period. Substantial earthen banks and ditches can still be seen. Old gravel pits can be found close to Latchmoor Farm, at the northern end of Setley Plain, whilst Setley Pond, on nearby Race Plain, is a favourite with model boat enthusiasts, but was created in more sombre circumstances after gravel extraction in 1941 for use in the construction of the runways at the Stoney Cross, Second World War airfield. Setley Plain’s Second World War contribution did not, however, stop with gravel extraction, for here was located a Prisoner-of-War camp, used initially to house Italians captured in Africa, but later also to accommodate German prisoners, many of whom were put to work in the Forest. After the war, until the 1960s, the camp, complete with its own shop, was used to provide housing, including for local gypsies who the authorities were keen to remove from the open Forest.